The Lithgow Small Arms Factory comprising the grid of roads, industrial buildings and related machinery, administration and storage buildings and cooling reservoir is important as the first ordnance factory established by the Australian Commonwealth Government, and as evidence of the Commonwealth`s commitment to develop a national armaments plant under Minister for Defence Thomas Playford from 1906. The Lithgow Small Arms Factory began production of short magazine Lee-Enfield .303 rifles in 1912, in parallel with the Commonwealth`s Maribyrnong Cordite Factory in Melbourne, which first produced cordite in 1912. These complementary munitions facilities marked the end of the use of black powder propellants by Australian troops, placed Australia on a par with other modern defence forces and ensured the future self-sufficiency of Australia`s Armed Forces. The location of the Small Arms factory at Lithgow clearly illustrates the decision in 1908 to develop a national armaments capability in a naturally defensive location away from the vulnerable coastal cities. The manufacture of cordite and armaments in Australia were national considerations consequent on Australia`s isolation and had been high on the agenda for Federation. Production of the Short Magazine Lee Enfield .303 rifles pioneered the use in Australia of American scientific mass production techniques, and contributed to Australia`s military contribution to the First (1914-1918) and Second (1939-1945) World Wars. Initial and later production processes are implicit in the complex of industrial buildings, which developed progressively on the site, in addition to the cooling pond. The complex includes buildings and structures which, as a group, demonstrate Australian self sufficiency and industrial development. Buildings 42, 44 and 60 erected in 1912 are important for their association with the first stages of production. Building 60 functioned as the central building in the original factory complex. Building 72, erected in 1924, and the Boiler House (Building 48), erected in 1942, and a range of buildings erected 1924-1943, are important in illustrating the development of the factory during the Inter-War and Second World War years. Two storey buildings of this period include the General Machine Shop (Building 72), the Vickers Building (Building 52), used for the production of Vicker`s Machine Guns, the Rifle Production Building (Building 65), the Production General or Bren Building (Building 71) and the Administration Building (Building 62). Single storey buildings numbers 22, 23, 26, 45 and 57, document the functions associated with, and representing, the development and evolution of the factory during the Second World War period 1939-1945. The Small Arms Factory diversified production between the wars, maintaining skills and the viability of the factory. Commercial production included sheep shears, aeroplane airframes, golfing irons and movie projectors. The facility was the longest continuously operating ordnance factory in Australia before its closure and an essential factor in the economic viability of the Lithgow community. 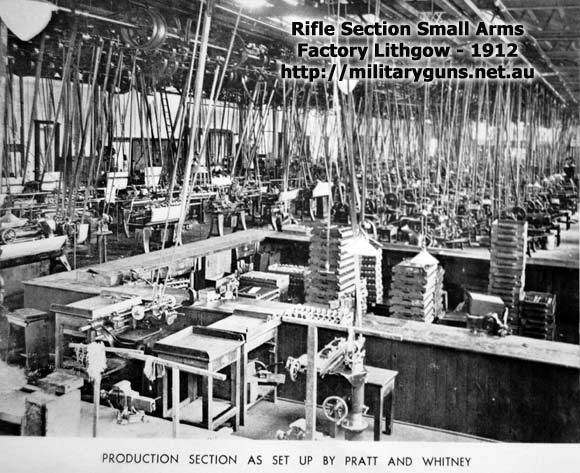 The Lithgow Small Arms Factory is important as the first Commonwealth armaments factory, and as one of a group of complementary Commonwealth defence facilities, which stemmed from Federation in 1901, including the Commonwealth cordite factory at Maribyrnong. Several of the original Pratt & Whitney and other early machines survive within the complex, which, in context with the original buildings, are important in demonstrating the functions of the first Commonwealth armaments factory. The Lithgow Small Arms Factory is important for its landmark and aesthetic qualities. These qualities are implicit in the boiler house chimney (Building 48) and the substantial, two storey, brick buildings of the Inter-War and Second World War years, which impart a monumentality of scale to the complex, not found in other similar complexes of this type. Buildings which particularly illustrate this monumentality and the use of the Stripped Classical and Moderne Styles include 52, the Vickers Building erected in 1924 and Buildings 62, 65 and 71, the Administration Building, Rifle Production Building and Production General Building of 1940-1943. Earlier buildings including Building 60, the Main Room Rifle Production, erected in 1912, and Building 72, the General Machine Shop, erected in 1924, contribute strongly to the architectural and aesthetic qualities of the industrial landscape which includes a range of supporting and linking elements, including Store Buildings 22 and 23 erected in 1940. The complex includes good examples in Buildings 74 and 80 of the modern functionalist style of design employing steel frames clad with brick and precast concrete panels. The Lithgow Small Arms Factory is highly valued by the Lithgow community for its cultural and social associations, which stem from its contribution, since 1912, to the economic and social fabric of the Lithgow area. 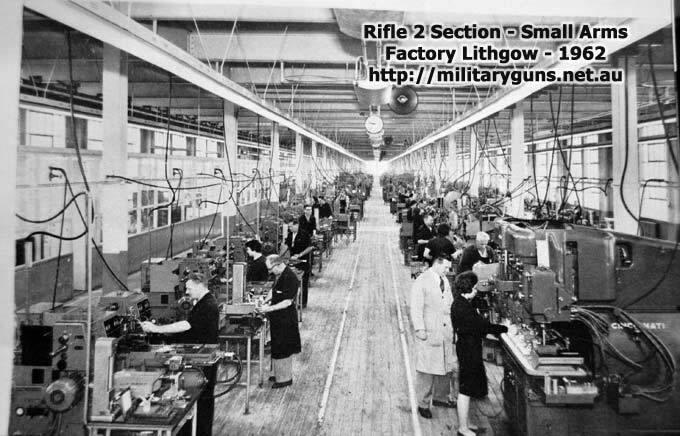 The Lithgow Small Arms Factory is important in demonstrating the principal characteristics of ordnance complexes designed and built by the Commonwealth in the first decades of the twentieth century. These characteristics include the use of an internal gridded system of roads and utilitarian, industrial buildings, many of which display the influence of the Stripped Classical and Style Moderne. Building 71, the Production General Building, illustrates the use of the Stripped Classical Style, Building 65 the Style Moderne. Store Buildings 22 and 23, erected in 1940, illustrate the characteristic utilitarian nature of supporting buildings erected during the Second World War. The Lithgow Small Arms Factory is important for its association with Sir John Jensen, Chief Clerk in the Department of Defence from 1914, under whom Australia`s Defence industries were adminstered in varying capacities until 1948. The Lithgow Facility comprises some 64 hectares located in Methven Street, Lithgow to the south-west of the town centre, on part of the former Cooerwull Estate. An internal road system provides access to a range of 1 to 3 storey production buildings set out on a gridded system of roads with kerbs and pathway. The layout of the Lithgow facility is comparable to other industrial complexes of the early twentieth century such as the Clyde engineering works in its setting out and use of utilitarian, general industrial and engineering structures. Armaments production involves a range of engineering and manufacturing works which can be housed in standard utilitarian industrial structures. Many of the production buildings at Lithgow are therefore representative of industrial buildings and complexes of their period. Extant buildings include a large number of single and multi-storey structures in sandstock brick or corrugated iron with pitched or saw-toothed trussed roofs concealed behind parapets or expressed as part of the elevation. Several of the buildings incorporate architectural details. Although many buildings are now devoid of their equipment, several of the original Pratt & Whitney and other early machines survive within the complex. In addition a number of production machines from the Second World War period have survived in addition to the 1942 Boilerhouse and chimney. The site also includes a reservoir or cooling pond and a proving range for weapons. Located outside the present ADI site are three houses, two built for the manager and accountant as senior staff, and a range of sheds, which are historically part of the property. The central accountant`s house is characteristic of the generic brick housing types erected from 1912 under the influence of Commonwealth Architect J S Murdoch. Structures external to the boundaries of the ADI site will be considered separately in a future assessessment. The buildings comprising the complex can be divided into categories which reflect the intitial development of the factory to produce short magazine Lee Enfield rifles overlayed and complemented by structures and services designed to accommodate new production techniques and changes in armament needs over time. Structures erected before 1925 comprise the earliest group with multi-storey brick buildings and single storey structures illustrating the expansion in armaments production during and after the Second World War. The earliest structures Include the remaining buildings erected in 1912, buildings 42, 44 and 60, and building 72, erected in 1924. The 1912 buildings are characterised by their large single storeyed forms with gabled roofs and parapets with kneelers at either end. Building 42 functioned as the Pickle Room and is associated with the remains of the bridge to the original coal bunker, Building 44 was the Box Make Out Works. Building 60, the Broaching Shop and Wood Shop, was the central building in the facility linking the various materials and components sections of the production process. Building 60 is characterised by the large brick arches in each gable, between shallow butresses. The multi storey buildings comprise Buildings 52, 62, 65 and 7, distinguished by their brick construction. The north end of the Vickers Building (52) erected in 1924, the first large multi-storey building on the site and the largest within the complex. A second stage was erected in 1933 to increase the production of Vickers Machine Guns and Bren Guns. The building is three storey steel framed clad with sandstock brick and had three service towers attached. The steel frame is expressed externally in shallow brick piers enlivened with red brick string courses and window dressings in the Stripped Classical style. Building 65, the Rifle Production Building, erected 1941-1943, and Building 62 erected in 1943 as the formal Administration building at the entrance to the site, are similar in character to Building 52. The windows and general design are typically Style Moderne in their expression. Building 71, The Production General Building erected in 1940, is predominantly single storeyed with double storey mezzanines at each end, and reflects the architectural form of its neighbours. This group of buildings imparts a monumentality due to the stripped classical origin and scale which stems from the use of designs nd materials not found in other similar industrial or munitions complexes. Single storey buildings include 14, 26, 35, 36, 45, 49, 57, 67and 74 which are in brick and Buildings 22, 23, 25, 27, 30, 48, 56, 58 and 75 which are constructed in corrugated galvanised iron or a combination of corrugated galvanised iron and brick. The corrugated galvanised iron buildings are utilitarian and characteristic of such buildings erected on all major munitions sites. The single storey buildings illustrate the progressive development of the factory from the beginning of the Second World War to meet the Commonwealth`s munitions requirements. Buildings 48 (Boiler House), 56 (Forge), 57 (Die Shop) and 26 (Indoor [weapons] Range) replaced earlier structures at this time. Architectural expression is limited, with Building 45, the former Maintenance Building, typifying industrial buildings of the 1940s.This structure however clearly utilises the materials and idiom of the contemporary multi-storeyed buildings and as such adds to the sense of scale and coordinated industrial nature of the site. Building 57, the Die Shop and Building 36, the Laboratory, display minimal architectural features but display continuity of detail. Building 35, the Cut-Off Shop, displays the introduction of Modernist elements in the curtain walling in its southern elevation. Buildings 22, 23, 26, 45 and 57 are important in illustrating war time expansion, and evolution of the site, during this period, in conjunction with two storey structures such as building 62, the Administration Building, erected in 1943. 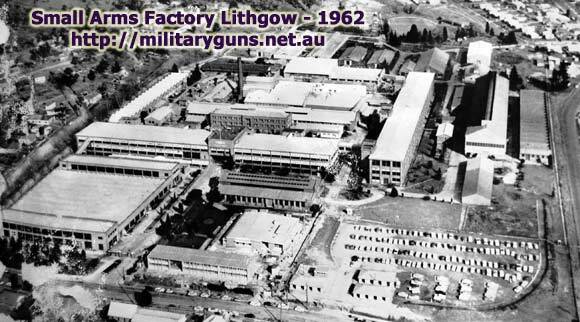 The continuing development of the Lithgow Small Arms Factory in the post war years is illustrated by Buildings 74 and 80. These are good examples of the modern functionalist style, utilising steel frame construction clad with brick and pre-cast concrete panels. Lithgow has been seen as a suitable site for a national armaments plant for over a hundred years. A small arms factory had been suggested by Major General Sir J Bevan Edwards as early as 1889 in a report on the Military Forces of the Australian Colonies, but the proposal to build a factory for this purpose was first made in 1895, just before Kitchener reopened the Sudanese wars, to which Australia had sent an expeditionary force in 1885. From 1901 the new Federal Government struggled with the issues of a munitions supply. For the first few years Australia`s sole supplier was the first and only manufacturer, the Colonial Ammunition Company, at Footscray. In 1902 Major General Sir ET Hutton recommended that such a factory should be part of a Central Arsenal. Suggestions had been made in Victoria in 1896 that a change should be made to a rifle using a cordite based propellant. One consequence of this decision was the need to import both cordite and new rifles. In Victoria new.303 rifles were issued to infantry with ammunition made at the Colonial Ammunition Co. Factory. The new Short Magazine Lee-Enfield was adopted in 1903 by the British Government. The 1903-4 quest for a national capital brought a strong claim from Bathurst and Lithgow through William Astley, Thomas Machattie and the Western Federal Capital League. One argument for establishing the Federal capital in the Bathurst-Lithgow area was defence. The fall of Sydney or Melbourne was a remote but not an inconceivable possibility. A Capital in the West, self-sustaining [with Lithgow coal], would be invulnerable, whether viewed as arsenal or fortress. The arms, cannon and ammunition in the arsenal at the Capital must be assembled with minimum cost of freight or hazards of transport. The Progress Association in Lithgow pressed the issue of an armaments factory in 1904 and William Sandford, the ironmaster offered a 2 hectare site, local Eskbank coal and a railway siding. In 1906 the Minister for Defence Thomas Playford sought estimates to establish a factoy capable of producing 40,600 rifles for the Australian Forces. Although the cost was higher than imported rifles, the benefits were seen as more important. The Commonwealth, for its part, had already in 1902 determined on building a factory for small arms, in particular rifles, and when Canberra was chosen as the new capital a central arsenal located there was discussed for Canberra. The political pressure of federal MPs from the Bathurst-Lithgow area, and in particular Joseph Cook, was important in convincing the Department of Defence that Lithgow`s impregnable position and natural resources made it preferable to Canberra for an armaments factory. Lithgow was visited on 16 January 1908 by Defence staff and in February 1908 a site was chosen, not in Sandford`s part of Lithgow, but on Brown`s Cooerwull estate on the edge of town: 48 hectares of land were to be resumed from John L. Brown (together with some 20 hectares from Lithgow Valley Colliery which were not purchased). The buildings were expected to cover nearly 4 hectares when completed. Final site planning and construction took place from September 1909, when Joseph Cook, the local member, became Federal Minister for Defence and the Small Arms Factory at Lithgow was given high priority for rapid completion. The contract with Jones and Allman to build the plant was approved on 20 January 1910 and the first main building, Building 60, was completed one year later. The machinery was imported from America with American experts visiting Lithgow in 1911-12. The Pratt and Whitney equipment from Hertford, Connecticut, installed in 1911, produced its first rifle in January 1912. The Small Arms Factory was officially opened on 8 June 1912. Accountant and chief clerk John (later Sir John) Jensen, from the Department of Defence, was appointed in February 1911. Jensen, a bureaucrat, was responsible for organising four factories and pioneered scientific management as chief clerk from 1914 in the Department of Defence. In 1918 Jensen went to Britain to investigate the ways in which munitions had been mobilised for the First World War. Jensen became the assistant secretary and secretary to the newly formed Department of Munitions in 1940. Jensen remained with Defence until 1948 working in the Department of Post-War Reconstruction and the Department of Immigration in subsequent years. Jensen House in Melbourne was named after Jensen in 1969. Tthe first manager, A.C. Wright, was an American sent out by Pratt and Whitney. In 1909 six Australians had been sent out to Pratt & Whitney`s works in Connecticut to train in the latest gun-shop methods and practices. The layout of the original factory was relatively simple. Building 60 with its 60 foot wide main room comprised the centre of the production areas with four fifty foot wide wings on its south side. The first three wings contained the forge and heat treatment, the power plant and press and the wood and polishing room. The rifle barrels were made at the east end of the main room. Building 42 accommodated a pickling room, with to the south a small administration building. The completion of the Maribyrnong Cordite Factory1907-1912 mirrored the completion of the Small Arms Factory at Lithgow 1908-1912 and ensured, in conjunction with the Colonial Ammunition Company`s factory at Footscray, an independent national supply of arms and ammunition. The number employed in the Lithgow factory grew rapidly, from 25 in March 1912 to 300 in August 1913. The Factory`s first sale took place in October 1912, with the first batch of 40 rifles completed in May 1913. By December 1913 1500 rifles with bayonets had been manufactured. A decision was made in late 1913 to expand the production from 15,000 rifles annually to 20,000. The factory soon became a tourist attraction in the Blue Mountains. Extensions, and a residence for accountant John Jensen, were built in 1913 and the onset of war in 1914 brought increased production, extra shifts and a labour force which reached 1150 by the end of hostilities in 1918. In November 1914 production was increased to 35,000 rifles per year. In 1915 the factory was exanded by the addition of over 190,000 square feet. New structures included an Assembly and Viewing building, a new L shaped Sheet Metal and Heat Treatment building and a new Toolroom. The factory was the largest employer in Lithgow which benefited doubly from the war effort, when the local wooIlen mill captured the `Khaki contract`. Pioneering American techniques of mass production, with precision tools and highly trained personnel, some of them English, the Small Arms Factory produced over 30,000 .303 Short Magazine Lee Enfield rifles for the British forces in the First World War as well as supplying Australian forces. 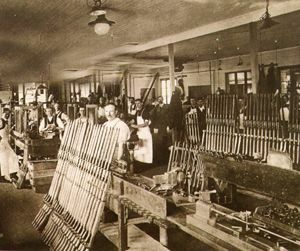 Although rifle production declined in the 1920s with a consequent reduction in the work-force, new ventures diversified the plant. One was the Vickers .303 Machine Gun, manufactured in a new multi-storey building, Building 52, after 1924. The others were commercial contract work such as sheep shears, aeroplane airframes, golfing irons and movie projectors (a very successful venture, supplying most Australian cinemas in the 1930s) in addition to tools and equipment for the Lithgow collieries. Manufacture of the Vickers required the construction of new buildings including a general machine shop and a three storey 300x60 foot building for the manufacture of pistols and machine guns. The production of rifles was scaled down during the Inter-War years but was reintroduced in 1933 to maintain skills. From 1937, the manufacture of the Bren Gun resulted in the extension of Building 52 in 1938. The Second World War saw a great increase in arms production; 12,000 people were employed by the Small Arms Factory (SAF) and small feeder factories at Portland and places further west. Feeder factories were established at Forbes, Wellington and Mudgee to keep up with the demand. In 1941 Bren guns were added to rifles and Vickers machine guns, with a weekly peak output of 4000 rifles, 150 Bren guns and 70 Vickers Guns. This expansion in 1941 required the construction of Building 7 for Bren Gun production, and a new Toolroom (Building 65), Boiler House (Building 48) and new Heat Treatment building (Building 45). Much of the plant and equipment was replaced. New shooting ranges were established with a Forge (Building 56) and Die Shop (Building 57) added. By 1942 a managers house and a third staff house had been erected adjacent to the accountant`s residence. The end of the war again saw a reduction in armaments production, but the precision engineering projects for civilian use remained important, including components for railway locomotives. During the Korean War of 1954-55 production of the Fabrique National .300 rifle ran smoothly from 1955 following modernisation of the factory complex. After the Korean War no more machine guns were manufactured. Lee Enfield rifles ceased production in 1956 but a new rifle, the 7.62 mm L1A1, was produced in large quantities from 1979 onwards, in new buildings with modern machine tools. The continuing economic viablity and importance of the facility was reinforced in the post-war period with the construction of new buildings including Building 74, the Canteen, and Building 80, a new Administration Building. The latter now functions as a security office and museum. From 1980 the facility manufactured metal components for rockets, troop carriers and shells. This required the installation of a continuously operating twin track overhead conveyor system. Some of the old Pratt and Whitney equipment was sold at auction in 1981, but a great many early machine tools still remain in the SAF Museum. The original 48 hectares of Brown`s land still constitute the plant, but an additional 12 hectares have been added to provide a rifle range. 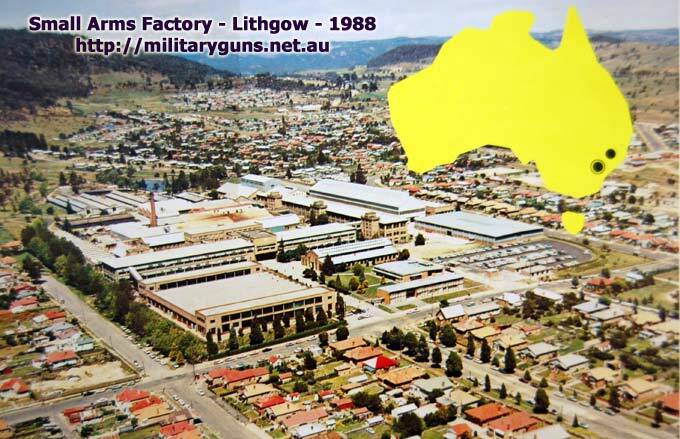 After the formation of ADI in 1989 the Small Arms Factory became part of the Weapons and Engineering Division and was known as the Lithgow Facility. The influence of the SAF on the heritage of Lithgow goes, beyond the works themselves. Workers` housing was needed from the beginning and was critically needed in wartime. As soon as J.L. Brown sold his 48 hectares for the enterprise in 1909, he decided to subdivide some of the adjacent land: the Extension Estate was advertised in two stages on 11 April 1908 and 26 March 1910. In 1908 163 lots out of 237 were sold between Hassans Walls Road and Calero Street. In 1910 a further 431 building lots were offered together with the 74 unsold two years before, extending as far as Factory Street and creating Ordnance Street. The final stage of SAF-related sub-division came in 1913 when what was known as the Cooewull estate was sold, adjacent to the 1910 area, in another 494 lots. This last sale, just before the First World War broke out, created Enfield Street, Bayonet Street, Rifle Parade and Martini Parade. In the vicinity of the Small Arms Factory, therefore, no fewer than 1162 new house-blocks were created between the initial planning of the factory in 1909 and its first year of full production in 1913. A further effect of the Small Arms Factory was to add Lithgow to the `Sydney Fortress Area` created in 1941, after Japan entered the Second World War. To protect Australia`s munitions industry from attack by air or by land, anti-aircraft guns and a detachment of machine-gunners were placed at Lithgow. In 1941 the Lewis machine guns were placed on the flat concrete roof of the main SAF building (still surviving but with the addition of a pitched roof) while the anti-aircraft guns were sited at Bowenfels in the grounds of the old Presbyterian manse in Kirkley Street. In 1942 concrete batteries were built, one to protect the guns at Bowenfels, the other on the top of Scenic Hill to protect the ammunition depot in the old Clarence tunnel. The Clarence emplacement (which still exists) was disguised as `Hokes Village` with imitation houses, shops and even animals, while at Bowenfels the manse was disguised as a farmhouse with cattle yards, poultry, pig pens and a skeletal barn. At Marrangaroo, where there was a major ammunition depot also, another village called `Hokesville` sprang up, complete with a pseudo-hotel. This defensive activity continued around the Small Arms Factory and its ammunition stores until January 1944. About 15ha, Methven Street, Lithgow, comprising the whole of the factory area.